Brig. Gen. E. John “Dragon” Teichert, Commander 412th Test Wing at Edwards AFB greeted guests attending the annual Civ-Mil BBQ and expressed joy over being assigned to Edwards once again. It was that time of year again … a time when Frances Lane of Palmdale, Calif., opens the gates to her sprawling Hacienda Lane Ranch and welcomes military leaders from Edwards Air Force Base, community business leaders, government officials and just plain community folks in celebrating the ongoing camaraderie and support that each group offers one another. Billed as the Annual Civ-Mil Barbecue, the event, this year held on July 20, has been taking place at the ranch for nearly 30 years and gives everyone attending a chance to mingle and enjoy a night filled with food, entertainment and fun, while at the same time giving folks a chance to appreciate each group for their continued support of the base and local communities. 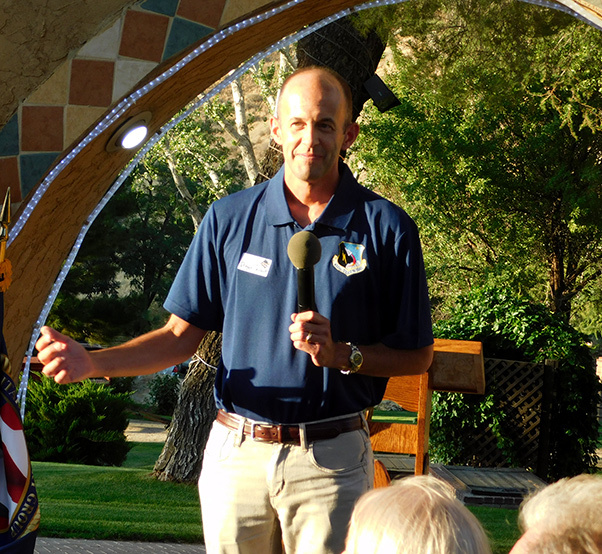 Allen Hoffman, current president of the Civ-Mil Support Group, said the yearly event not only serves as a fundraiser for Civ-Mil, but also offers locals the opportunity to meet base personnel. Hoffman welcomed everyone attending the event and introduced special guests. Community folks joined military personnel and local business leaders at annual Civ-Mil BBQ in a strong show of support for Edwards AFB. 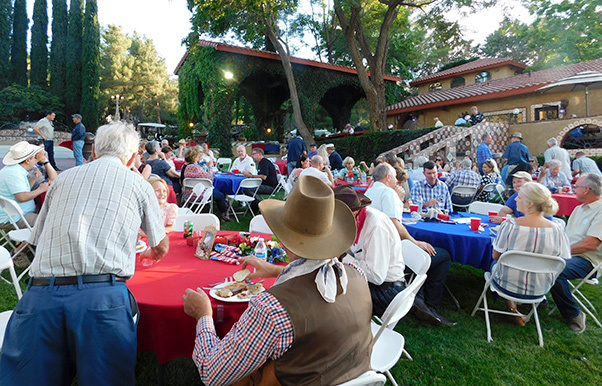 Congressman Steve Knight, U.S. Representative for California’s 25th congressional district and his wife Lily, were among the evening’s guests along with Brig. Gen. E. John “Dragon” Teichert and his wife Melonie. Knight talked briefly about some of his accomplishments since becoming a member of Congress and said he was able to secure the biggest raise in 8 years for America’s troops. “Our top priority is our veterans, that’s what we do best, and we’re good at it,” he said. Since taking over the command of the 412th Test Wing from Maj. Gen. Carl Schaefer, Teichert has taken on the responsibility of leading some 7,900 personnel in developmental test and evaluation of numerous aircraft, including remotely piloted aircraft. Turns out Teichert is no stranger to Edwards AFB; he has served at the base in the past and says he’s happy to be back. “We are absolutely thrilled to be back here at Edwards and the Antelope Valley,” Teichert said. The Teicherts have been stationed at Edwards three times and two of their children were born at Antelope Valley Hospital. 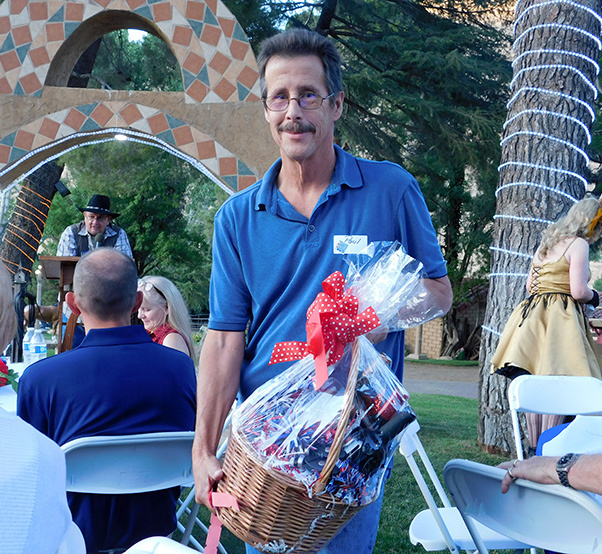 Lucky Ticket: Owner and publisher of the Aerotech News and Review publication, Paul Kinison, walked off with not one but two grand door prizes during the annual Civ-Mil BBQ that was held at the Hacienda Lane Ranch July 20. Teichert said his wife has lived in California five different times and he has lived here six different times, “And if that isn’t enough for you, our absolute favorite place to eat is In-N-Out Burger,” he said. For many folks attending the outdoor event, it was the first opportunity they’ve had to meet the current base commander. 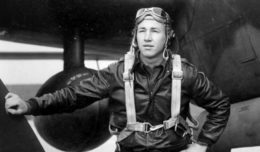 Teichert thanked everyone for making his family feel so welcome, “We are pleased to be a part of this community that is indeed the center of the aerospace universe,” he said. On behalf of the Civ-Mil Support Group, Bud Reams presented Lane with a United States Air Force emblem and thanked her for being an amazingly gracious host for the past two decades. Civ-Mil members also gave Lane a gift of dinner for two at a restaurant of her choice to show their appreciation for opening her ranch for the event. “It’s been 27 years and it’s been fun every year,” Lane said accepting their heartfelt gifts. Speeches were few and short, allowing guests to mingle and party on, enjoying the warm, breezy summer night at the picturesque Hacienda Lane Ranch. 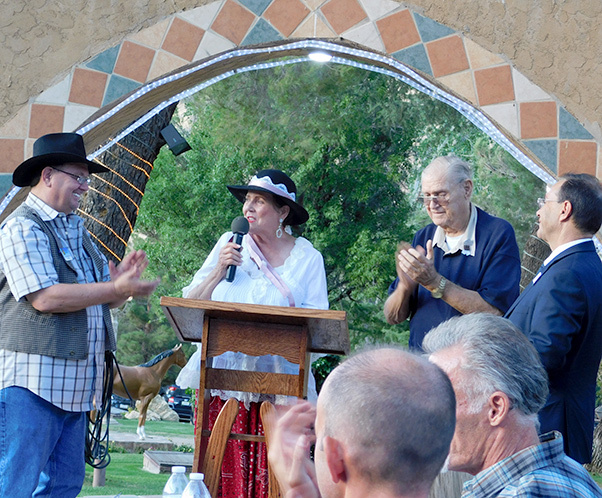 Civ-Mil member Bud Reams presented Frances Lane, owner of the Hacienda Lane Ranch a United States Air Force emblem in a show of gratitude for Lane’s support to Edwards AFB and the Civ-Mil Support Group throughout the years.